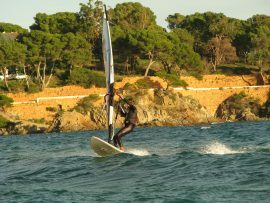 In our Sant pol’s bay you will find ideal conditions for windsurfing practice. It’s morphology and winds will help you learning windsurf. We offer 2 days and 5 days courses .In all of them you will be accompanied by or instructors. First in the beach they will teach you the basic notions and theories you need to know. After that in the water you will be accompanied and advised by our instructors from a boat, from where they will give you all the explanations so that you can learn windsurf with total security. With our courses you will learn all that’s necessary y to handle a windsurf. the basic concepts such as the tacking and the jibe and maintaining balance on the windsurf board. 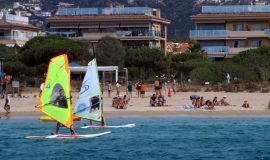 If you wont to have a Little taste to see if you would like to practice windsurf, you have the chance of doing a private lesson for a maximum of two students. In our private lesson you will have the personalized attention of our instructors. Private lessons are also interesting if you already practice windsurf and you wont to improve any detail, or you think there is something that’s needs to be improved. If you have experience and you wont to practice by yourself , you can rent a windsurf, we have different sizes boards and sails, to adapt to conditions and different skills. If you are on holiday in Costa Brava come to sant pol’s bay in s’Agaró Sant Feliu de Guíxols really close to Platja d’Aro. Don’t think twice and start windsurfing.